Cameron Spencer is his name. He’s the man who took the instantly iconic photo of Usain Bolt smiling like he was the most relaxed guy ever in the middle of the Men’s 100M Semifinals at the Rio Olympics earlier this week. It may not be Ali roaring over a fallen Liston, but count on seeing this photo in pretty much every article or documentary about Bolt that ever gets made from here on out. And definitely count on seeing it all over social media for the next few days, appropriated for every possible meme and joke. The floodgates opened immediately after that photo was first revealed, and the deluge has only picked up the pace since then. 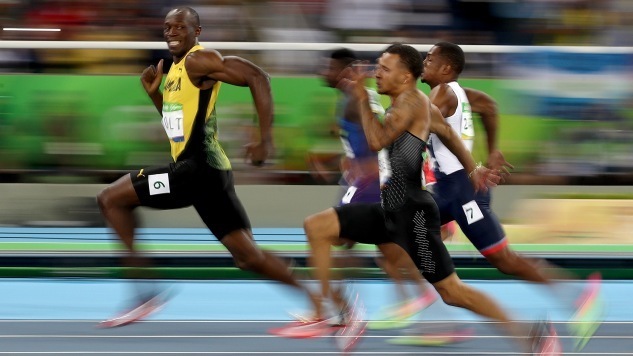 Here’s a quick look at the best of the best so far, the funniest Smiling Usain Bolt memes to shoot through the internet over the last day.